Home sales at the nation’s top master-planned communities (MPCs) were the strongest since 2007. Every year since 1994, RCLCO has conducted a national survey identifying the top-selling MPCs, followed by in-depth interviews among the top 20 to reveal the trends behind the numbers. Sales in the top 20 are over 37% higher in 2012 than in 2011, due in part to strong gains in communities located in states hit hard by the housing bust—including Nevada, Florida, and California—as well as continued strength in Texas. Deepening buyer pools with stronger credit and heightened consumer confidence—trends that began to present themselves in the latter part of 2011—continued throughout 2012, pushing sales at the top 20 communities to nearly 14,300. Beyond improvements in the housing market and the overall economy, MPCs also credit their enhanced sales to buyers’ belief that MPCs are the best place to invest, given the variable quality and level of remaining dis-tress in other locations, allowing MPCs to maintain their strong market share from 2011. 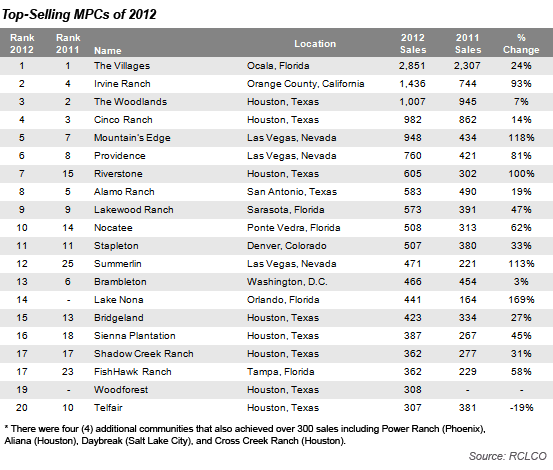 The Villages in Ocala, Florida, once again tops the list of top-selling MPCs, increasing sales by 24% over 2011. While impressive, there are numerous communities in this year’s list showing even stronger percentage gains over 2011 elsewhere in Florida (Lakewood Ranch, Nocatee, Lake Nona, and FishHawk Ranch), as well as in Las Vegas (Mountain’s Edge, Providence, and Summerlin) and Southern California (Irvine Ranch), where sales in top-selling MPCs increased by 47% to over 150%. In addition, Texas communities, which already had relatively strong sales in 2011, saw significant increases in sales and pricing at many communities during a year of robust employment growth and declining lot inventories in maturing MPCs. Across the west, there are several factors contributing to the significant uptick in sales in these high-quality MPCs. First, job growth, though still modest, is accelerating, thereby increasing household formation. Second, investors and first-time homebuyers are increasingly active as they recognize the exceptional affordability of home ownership relative to earlier periods. Lastly, the substantial “shadow inventory” is being reduced in a meaningful way, particularly through the rapid expansion of single-family rental investment programs. In Houston, where new home sales increased by more than 25% overall, mature communities such as The Woodlands and Cinco Ranch experienced less rapid increases than the market as a whole. This is primarily because these communities are not offering as much product diversification as in previous years as they approach buildout, reducing their sales volume in many lower price points while increasing sales (and market share) in largely upper price points. Houston communities with fewer land constraints, however, were able to take full advantage of increased demand across the region, increasing sales over 2011 from 27% (Bridgeland) to 100% (Riverstone). Although demand is up sharply, lot development continues to lag absorption, and lot inventory is at its lowest level in nearly 10 years. Pressure is on MPCs in Houston and in markets across Texas, such as Austin and North Dallas, to deliver more lots as inventories dwindle and mature communities approach buildout. Builders are becoming anxious about their ability to meet increasing demand and are stepping up efforts to self-develop smaller communities to capture increased demand in the absence of new replacement master-planned communities. The ranking of 2012’s top 20 communities is based on total home sales as reported by each individual community. We are currently conducting in-depth interviews with the top performers, and we will highlight and provide analysis of the critical success factors and strategies the top-selling communities employed to boost sales to the highest levels in five years. Key community investments, product innovation, marketing tactics, new business lines, and builder relationships are among the many topics our detailed analysis will explore, which will be published in an upcoming issue of the RCLCO Advisory. Article and Research prepared by Todd LaRue and Pamela Cantrell of RCLCO’s Community and Resort Advisory Services Group. Interested in learning more about RCLCO’s Community and Resort Advisory Services Group, please visit the Community and Resort page.